Roger Williams Park Zoo’s three African elephants are happy, healthy and thriving. I spent the afternoon with Lisa Ruggiero and Jennifer Warmbold, two elephant keepers at Roger Williams Park Zoo, along with Ginny, Alice and Kate, the three female African elephants that reside in the zoo. We chatted as the girls each got a bath and a few snacks for following instructions. All about thirty-four years old, they are a perfect example of a cooperative herd thriving in the care of a well-equipped zoo. 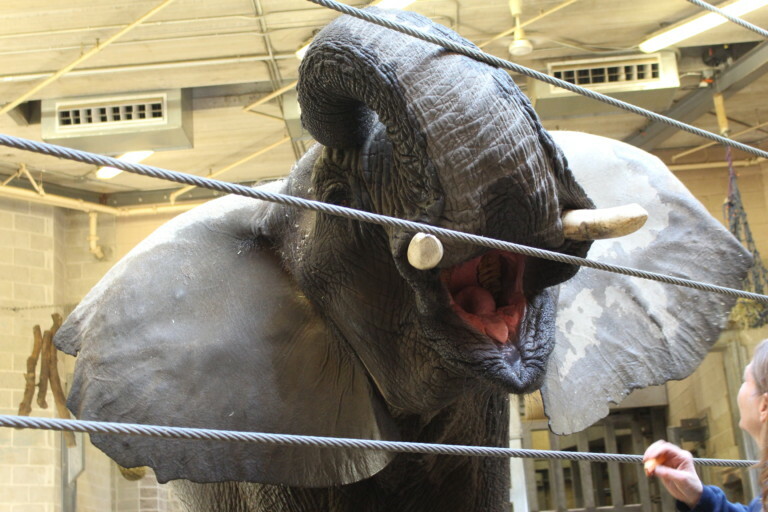 Behind the large showing room, where the public can see these lovely ladies during the winter, there’s a large “Sand Room,” an enclosure with a dirt and sand floor and nets full of hay hanging from the high ceilings. “Our program is all about building a rapport with the animals,” says Warmbold, who’s worked with this particular group of elephants for more than ten years. This is clear to see. While bathing Ginny, Ruggiero commands her to lie down so Warmbold can scrub her back. Ginny can’t see Ruggiero, but can hear her comforting voice, repeating calm words of praise. The steady stream of food she is given as a reward probably helps. While we chat, random questions continuously pop into my head. (“How do elephants lose their teeth? Is that a special soap you’re using? Do they have favorite foods? How on Earth do you weigh them? !”) Without fail, both Ruggiero and Warmbold are more than able to answer any questions I have. I learn more about elephants today than I’ve ever learned from an episode of Planet Earth on Netflix. “They’re the only African Elephants in New England,” says Ruggiero as she tosses Ginny a slice of carrot followed by a bit of zucchini. The keepers at Roger Williams Park Zoo love their jobs and the animals they work with. There’s a mutual, understood air of respect between the animal and the keeper. They form special bonds with each creature, and it shows. Have you ever wondered what it would be like to stick your whole hand in a vacuum cleaner? That’s what it feels like to feed an elephant.